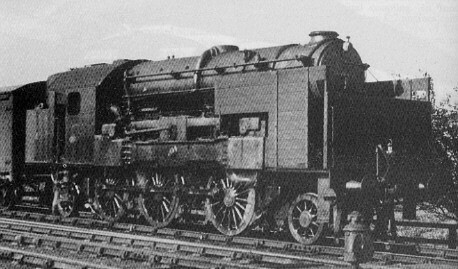 Although not technically an LNER engine, this Kitson-Still hybrid ran most of its trials on LNER lines, and regularly ran a daily freight service from York in 1933-4. The Still engine had already enjoyed some success in marine and stationary applications. The basic principle was that of a diesel engine with double acting pistons. One side of the pistons was diesel, and the other side was operated by steam. The engine was started by steam, and when sufficient speed was reached, diesel fuel was injected into the diesel side of the cylinders. This steam starting allowed direct propulsion without any form of transmission. Although electric transmission is used on virtually all modern diesel locomotives, in the 1920s such systems were still very immature. The Still arrangement also allowed the steam propulsion to be used as a "booster" when extra power was required. An oil burner was fitted to the steam boiler to enable initial starting, but exhaust heat from the diesel was also used to partially heat the steam. This heating from the exhaust heat, had the effect of improving the efficiency to about 40 per cent - exceeding all contemporary engines. In the 1920s, diesel locomotives were still at a primitive stage, and Kitson&Co. of Leeds believed the Still principle could be applied. Patents were filed in the early 1920s, and construction of an experimental engine started in 1924. This engine had a 2-6-2T or 1-C-1 wheel arrangement. Its eight cylinders were arranged in two horizontal banks. The cylinders were horizontal, parallel with the drive axles, and operated a central crankshaft. The cylinders were double acting with steam operating on the insides of the cylinders, and diesel on the outside. Gears, a layshaft, and coupling rods transferred the power from the crankshaft to the three drive axles. The relatively small boiler was positioned above the engine, and had a cylindrical oil-burning firebox. Exhaust gases from the diesel engine fed through tubes in the boiler, and the boiler water also circulated through the cylinder cooling jacket. Both circulation systems helped to capture waste heat from the diesel process. Steam was used for many of the auxiliary systems such as the brakes and whistle. The oil burner was used to create steam for starting. When about 5mph was reached, diesel fuel was injected into the diesel ends of the cylinders. After about two revolutions, the steam was then shut off until needed for the next start, or as an extra boost for greater power output. The design speed was a maximum of 43mph, but this was increased to 55mph as tests proceeded. Intermittent tests were performed on LNER rails for a number of years in the Leeds and York area. The LNER was clearly interested, and even exhibited it at an LNER rolling stock exhibition at Leeds in April 1928. Later in 1928, it successfully hauled a 400 ton goods train from Darlington to Starbeck and back. It managed to restart this load on a 1 in 33 gradient from a signal stop. For later trials, the LNER loaned their dynamometer car. By 1933, the locomotive had become sufficiently reliable for it to be based at the York shed and to regularly work a daily goods to Dairycoates and back. As well as its good starting abilities, the Kitson-Still was found to consume about a fifth of the fuel (by weight) compared to a typical coal-burning steam engine. The exact economics would vary according to the relative prices of coal and oil fuel. Kitson planned to target countries with good oil supplies but no coal. The available power of the locomotive for its size, was relatively low, and this would have had to have been improved for commercial use. This final development from an experimental unit into a commercially viable one, would have required large expenditures which were not then available due to the poor financial condition of Kitson&Co. Development and testing of the Kitson-Still engine took the good part of ten years and at great expensive. As such, it was a large contributing factor to the downfall of Kitson&Co, who called in the receivers in 1934. After this, the engine was layed up at York North Shed until at least July 1935, after which it return to Kitsons to be disposed of. By the time that Britain's railways were ready to adopt large diesel locomotives, the previous problems with electric and hydraulic transmissions had been overcome; and the Kitson-Still experiment was forgotten. The Kitson-Still locomotive was broken up by Kitson&Co after July 1935. I am not aware of any models of the Kitson-Still experimental locomotive. Thanks to Kyle Nicholas for providing much of the above information. Also: "Locomotives of the LNER, Part 10A Departmental Stock", published by the Railway Correspondence and Travel Society (RCTS).